HUGE shout out to the people at HBO and The Game of Thrones Facebook page for posting my pin-up of Khal Drogo and Daenerys Targaryen! I can not thank you enough, the response has been AMAZING and I am very grateful for the exposure! Thank you to ALL the fans who "liked" it and all the fans who commented on it! Game of Thrones Season Finale! 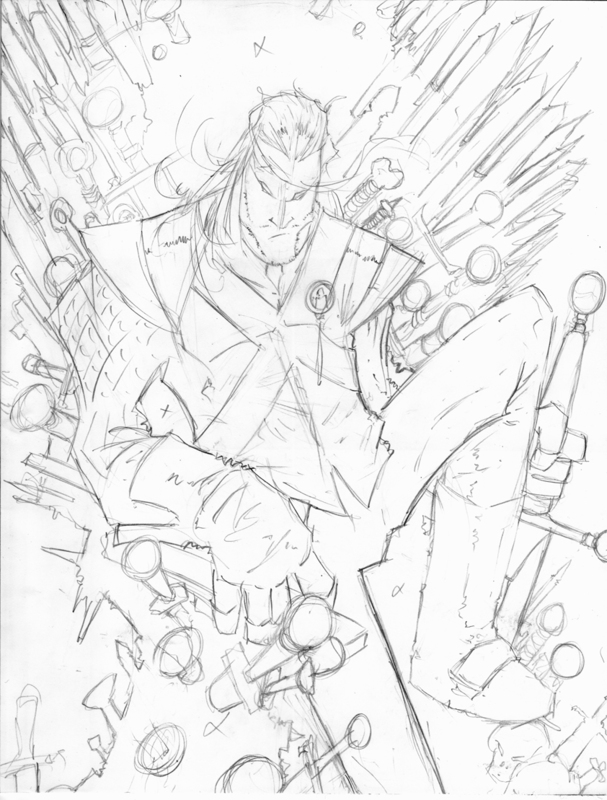 So here is my next piece in my series of Game of Thrones pin-ups. I got such AMAZING feedback and compliments from my Eddard Stark drawing on the Official Game of Thrones Facebook Page and the makinggameofthrones.com Blog, including the requests by many to do a version of Drogo and Dany! 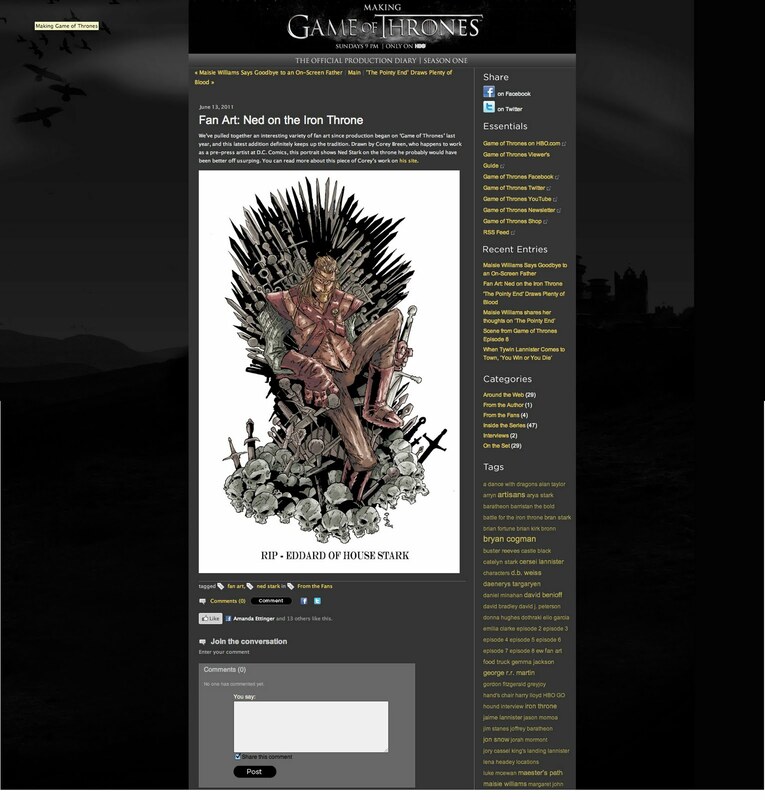 I thank everyone, especially everyone at HBO and @GameOfThrones on Twitter for them featuring my drawing on their sites, and linking to my Blog. I thank everyone who commented on the piece and for your suggestions on who to draw next from the series. Everyone wanted me to draw the Khal & Khalessi, and Tyrion. I decided to do the former first. I have a drawing done of Tyrion, so that one will be next. I hope you like, and below is the process of the piece. I first did separate sketches of Drogo and Daenerys. 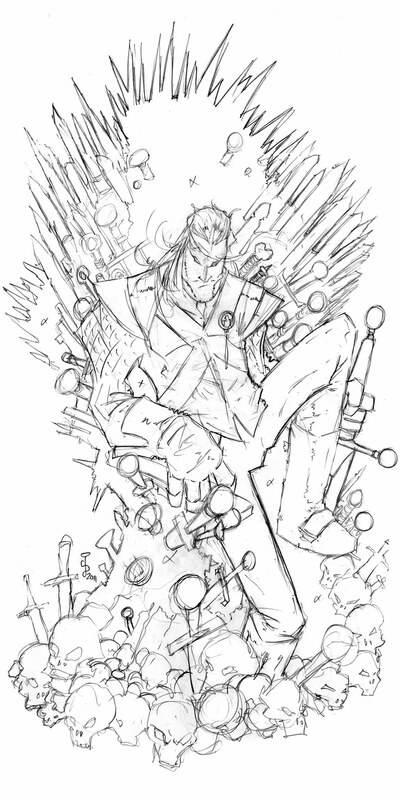 Then I scanned those in, and combined them in Photoshop on how I wanted the final piece to be drawn. When I was happy with that, I printed that out on 11 x 17 paper. 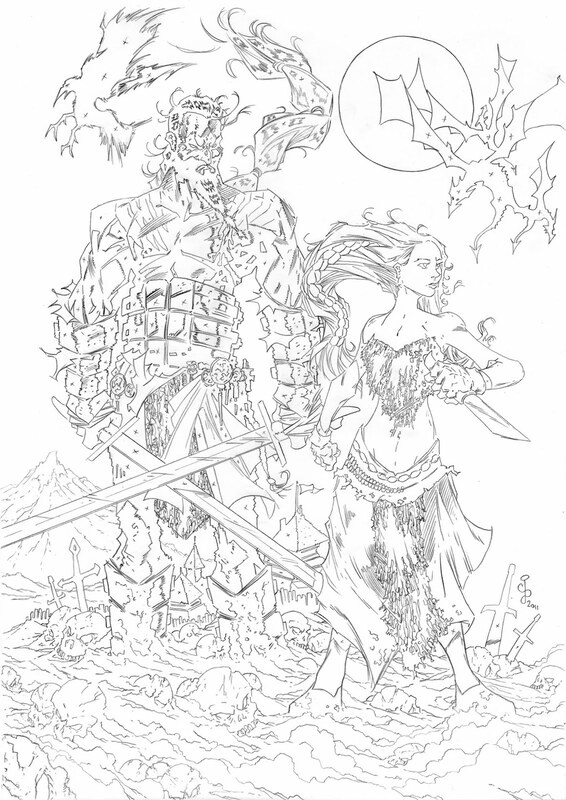 Then I put it on a light-box and did the finished pencils on my favorite paper, Letraset Marker Paper. Then I scanned that in and did the inks digitally. Then I went straight to colors in Photoshop. 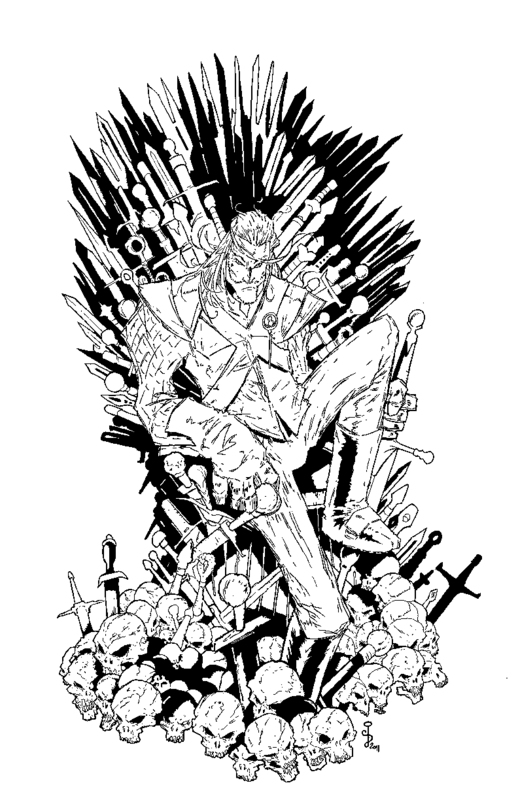 Hope you like it, and next week, Tyrion Lannister! 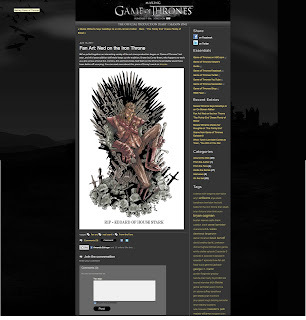 Enjoy the season finale this Sunday on HBO and HBOGO.com! 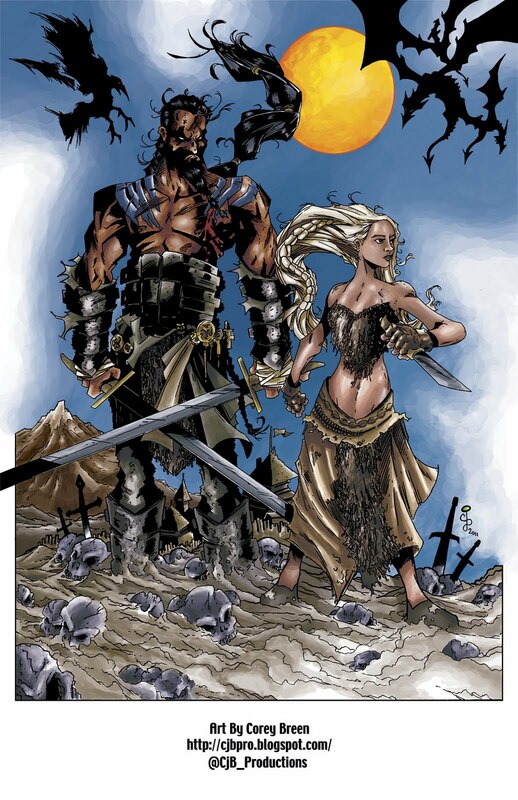 Can't WAIT to hear everyone's reaction to the fate of Drogo and what happens to Daenerys at the end! People are gonna go NUTS who haven't read the book! 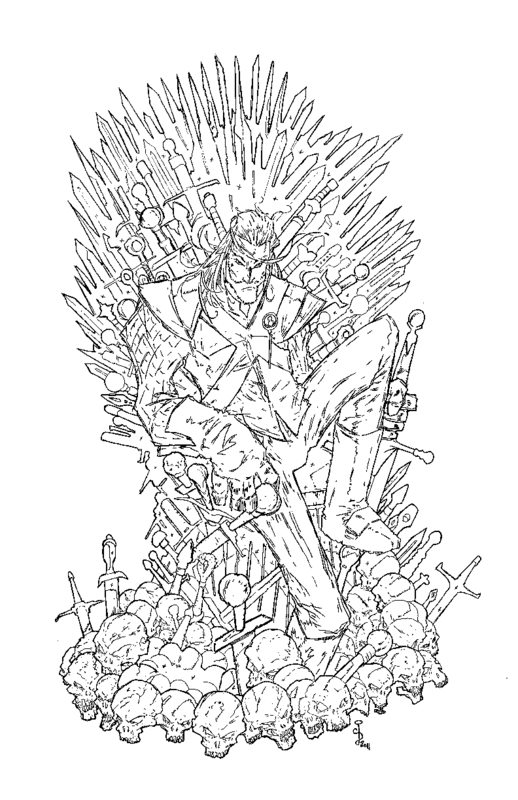 My Eddard Stark Drawing Featured on HBO-Making Game of Thrones! Thank you HBO, and Making Game of Thrones! 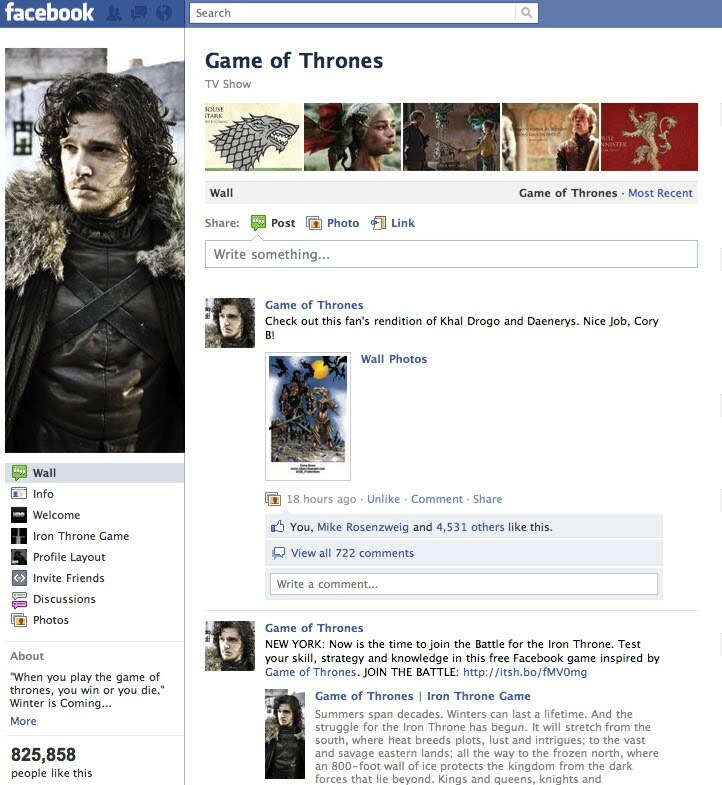 Thank you especially to @gameofthrones over on Twitter, and to everyone who commented on the piece and "LIKED" it over on the Game of Thrones Facebook Fan Page! UPDATED Eddard Stark Upon Fan Request! 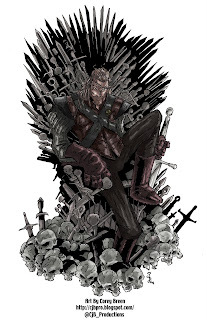 Eddard Stark - Game of Thrones - SPOLIER EDITION! 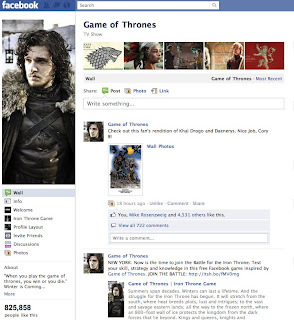 Once I heard about HBO adapting Game of Thrones for TV, I was like, "cool, but what's Game of Thrones?" I did some research, and was told by a good friend of mine from college (thanks Ryan!) 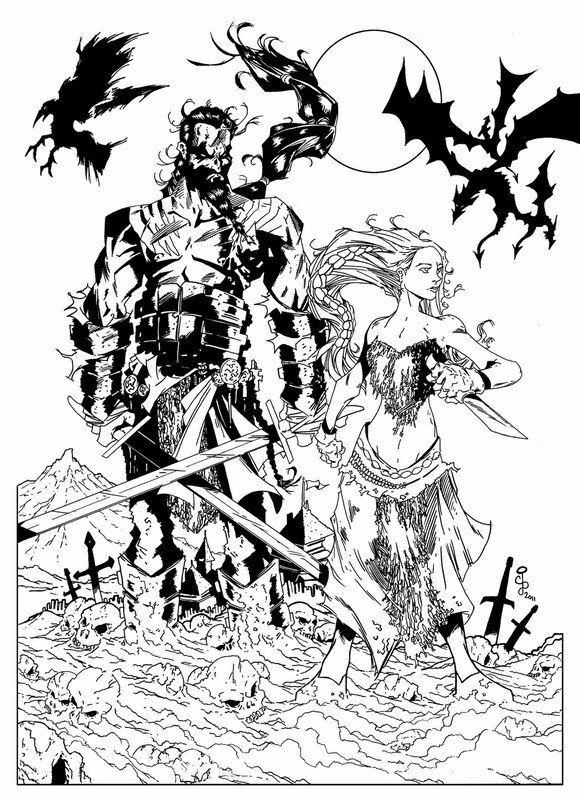 that is one of the BEST fantasy series ever written! That it was four books, soon to be a fifth this summer. So, seeing some commercials on HBO about the show, that it looked like a Lord of the Rings for adults, I ran out and picked up the novel, Game of Thrones. I had thought that the book as thick as it was, contained ALL four of the novels to date. Lo and behold, it was ONLY the first book of the series, which is called A Song of Ice & Fire. I was like, "whoa, this is gonna be daunting." The book is HUGE, and then they're are four more! But I was determined to give it a shot. Well, fast forward about 3 weeks now, and I'm well into the second novel, A Clash of Kings! Suffice to say, I am in LOVE! Game of Thrones was the BEST book I have EVER read, period. HANDS DOWN! I'm not kidding! I flew through it. And now I can't get ENOUGH of it! The show, the novels, anything! It's actually been REALLY cool too, watching the show, because it's like it's been INSTANTLY adapted as I read it. It was great to read the book and just tune in every week and watch it unfold in live action, all over again, just like it was in my head. It's so GOOD too! The casting is SUPERB, especially Eddard Stark and Tyrion Lannister! WOW! They are BRILLIANT! But... now I am ahead of the show by FAR! So I know what's gonna happen on the show, since it's been pretty much word for word the same. Some parts have been added that weren't in the book (which have been great), and some parts kind of rushed on the show, that were longer in the book (as with any adaptation). But all in all, I think the rest of the show is gonna play out exactly like the book did. So in that sense, I know whats coming up, and that's why this is a COMPLETE SPOILER for anyone who has not read the books and is just watching the HBO show. 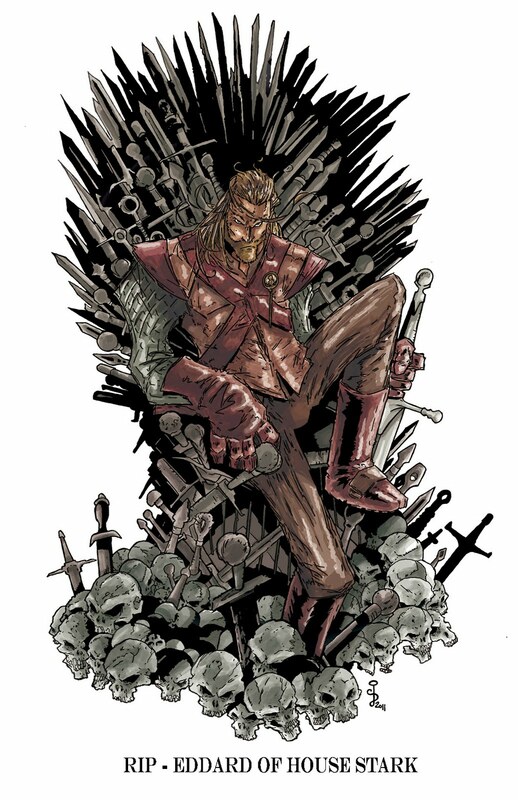 Yes, Eddard Stark is not long for Westeros. This was a tough call. Should I post this or not? I decided that the books have been out there for like over 10 years, so it's not REALLY a spoiler. I'm sorry if this ruins the show for some of you, but real fans of the show should read the books first. Seriously, READ more. Reading is AWESOME! LOL Anyway, if you want the spoiler, highlight the above paragraph and the below paragraph! Anyway, Eddard Stark is doomed. Now he is gone. And I am so UPSET about that! 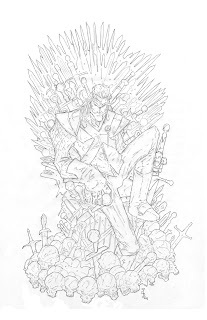 Eddard Stark has now become one of my FAVORITE all time characters, right up there with Snake-Eyes, Batman, Blacksad, Starman, The Rocketeer, Luke Skywalker, Hunter Rose and Cerebus. So I wanted to do a drawing of him, in honor of him, one that I felt was good enough to do him justice. For if ANYTHING, he deserves JUSTICE! Let me tell you, when his fate played out in the book, I had to put the book down, and take a moment to compose myself, I'm not kidding. It was THAT powerful to me. I don't know HOW I'm going to face watching it adapted on the screen this weekend. Although, who knows, maybe it's not even this upcoming episode titled "The Pointy End". 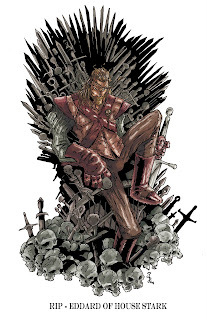 What if they decide to CHANGE the book completely and keep Eddard Stark on the show, because they love what the actor, Sean Bean is doing with him. COULD THAT BE?! Highly doubt it, because so much is predicated on his death, but I guess we will find out together this Sunday or next! So, as for the piece itself, I can't tell you how HAPPY I am with it. I think it's one of my BEST pieces yet, and I'll tell you why. 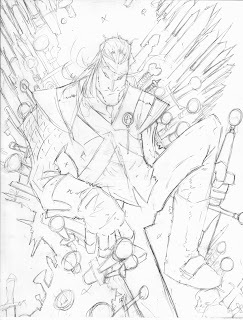 Firstly, it's because I really feel I nailed the character, the pose, the posture, the mood, the Throne of Swords, the blacks, the colors, and the textures. I really think it just all comes together as one, when sometimes my pieces wind up becoming very flat with inks, then just cartoony and too colorful with colors thrown on top not really matching the style. I think this piece really captures what my art can be. Then I throw that on a lightbox and draw a very detailed, very TIGHT line drawing onto Letraset Marker Paper. This paper is AMAZING! It is so SUPER thin, that you have to be careful, but it's like the most AMAZING paper I've ever drawn on. It was like MADE for me, that's how much I LOVE it! I'm doing ALL my concept art portfolio work on it, by the way. After I do a complete line drawing, I scan that in at 600 dpi. 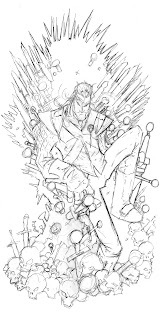 I mess wit the threshold and levels, getting the pencils to be a nice darkness, where I can finally bitmap the image. That is the start of my "digital inks". 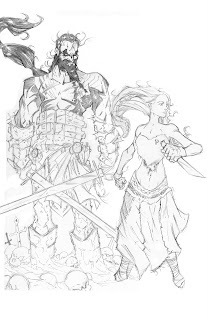 Then I zoom in, clean up all the line work, making sure nothing closed up on me, and I didn't lose anything like line weight when I played with the values of the grayscale image. Then I start filled in blacks, and redraw things and lines, getting nice crisp lines and fills. After that, I begin to color it. I LOVE to just use the pencil, at a opacity of 55%, on multiply. This let's me give a flat color off the bat, but when I go over, it darkens that color EACH time. SO it starts to look layered like I was painting. I LOVE this look. You just have to be careful it doesn't get muddy, especially reds. Then I clean up those colors, making sure I didn't color out of the lines, as they say, and TA-DA! My finished piece! I am REALLY happy with this process, and I think it shows in this piece. But as always, let me know what you think! PLEASE! And do yourself a favor and go read Game of Thrones, and then the other books in the series like I am. Don't just watch the show. I am SO happy I'm reading them all now. I'm sure I will be drawing more characters from the books and show in the future. PS- I LOVE stories where the hero dies, and dies early. I don't know why, I just do. Makes them a martyr I guess. Proves that the story is SO serious, and that ANYTHING can happen. That there is a lineage and a progression. It establishes a history, and a time line, that it's not just a story of the month, like, "this month, Spider-Man fights Doc Oct." I really like when you get SO invested in the characters, especially who you THINK is the main character (who can NEVER die, right?! ), and then all the sudden, they DIE! FOR GOOD! And then you get this progression of who the next hero is, but you're weary because now you know they can die at any time! Hey, just like life, unfortunately. That's just good writing, if you ask me! Now, off to continue reading A Song of Ice & Fire! PPS- One of the GREAT things about working digitally, is you can quickly tweak ANYTHING! 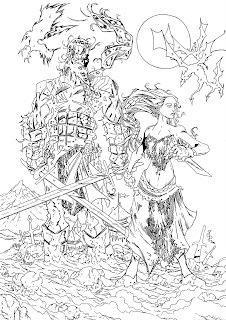 For example, if you notice, in the digital inks stage, I actually moved some of the skulls downward, and then extended his right boot, for it looked way too short in the pencil stage. Looks much better now, right? Also, in the final color stage, I felt I drew the piece a little thin. 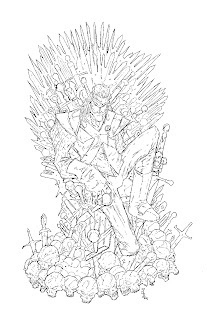 As in, the chair and Stark himself were kinda skinny looking. So I just free transformed and stretched the piece just a TAD to give it more girth. I think that really helped too. GOTTA love using the digital aspects as just another drawing tool! The amount of work it would've taken to fix stuff like that before? Unimaginable!